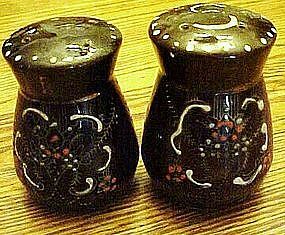 These old shakers are hand painted, glazed redware. Decoration is a raised moriage of scrolls, flowers and dots. Measures 2 3/4" tall more or less as one is slightly shorter than the other. One has an S on top for salt, the other has nothing. No chips or cracks. replacement plastic stoppers. Stamped Japan.